The World of Pooh [Family Book Review] – my books. my life. Because I think it’s never too early, we’ve started reading as a family. 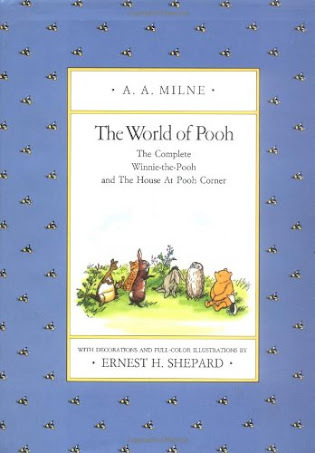 Currently we are reading Charlie and the Chocolate Factory, but our very first family book was The World of Pooh, which includes Winnie the Pooh and the House on Pooh Corner. Here is what my family thought of it. Michelle’s thoughts: Although I’m familiar with the stories, I’ve never actually read Winnie the Pooh. It was much funnier than I thought it would be and I was thoroughly entertained. Each character is different and I liked that all of the relationships between the characters was unique. But that last story was SAD. I think I actually had tears. Little boys don’t really need to grow up, right? Ben’s thoughts: Like Michelle said, I’m so familiar with these characters even though I’ve never read any of the books that some things were surprising. For one, Eeyore is meaner and less sympathetic than he’s made out to be in cartoons. And Tigger is much less spastic. However, I loved the bonds these characters share. Particularly those of Pooh and Piglet, and Pooh and Christopher Robin. The last chapter of The House on Pooh Corner might be one of the saddest chapters I’ve ever read in my life. Sad as it may be, it’s also one of the most touching scenes. Evan’s thoughts: I was pretty distracted by all of the sleeping and eating I did while my parents were reading to me. But the book sure did taste good! Any recommendations for family reading time? We read a lot of Roald Dahl and Shel Silverstein when I was a kid. I’ll let you know if I think of any recs! I like Evan’s thoughts. He really knows how to experience the whole book. I have never actually read a Pooh book before, but I am familiar with the characters. It sounds like this one might make for a touching read no matter what the age, and like Nicole, I love Evan’s thoughts on it. I also love that you are reading to him as a family so early. I think this is a great idea! I’ve read all of the Winnie the Pooh books with my five year old over the past year or so. We’ve also enjoyed some Boxcar Children and Mrs. Piggle Wiggle, as well as Charlie and the Chocolate Factory/Great Glass Elevator. Maybe you could read some of the children’s classics, like Peter Pan or Alice in Wonderland?